I just discovered the fascinating Wide-band WebSDR operated by the amateur radio club ETGD at the University of Twente in the Netherlands. 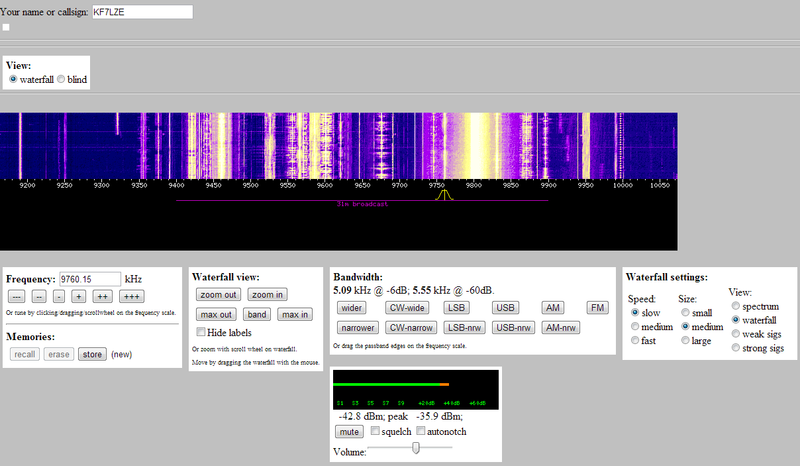 PA3FWM built a fascinating wideband SDR using a Xilinx FPGA, high-speed ADC and gigabit Ethernet interface to receive most of the entire shortwave and amateur radio bands at once and allow tuning and processing in software via an HTML5 or Java web browser. I’m listening to a station on 9760 kHz right now, which is broadcasting what sounds like classical choral hymns and dialog in Italian and Latin, so it could be a Vatican shortwave broadcast station. The interface is easy to use, and right now 142 users are tuning in from around the world. It’s definitely worth checking out. I like shortwave listening but even with a great converter and my RTLSDR, my location just isn’t optimal for receiving the kind of signals I’m interested in – this web option is a lot of fun to go exploring. This entry was posted in Internet, Radio and tagged ETGD, ham radio, internet, Netherlands, PI4THT, radio, radios, SDR#, shortwave, shortwave listening, tuner, University of Twente, websdr. Bookmark the permalink. There is an list on http://www.websdr.org with many similar receivers around the world which use same software in background but different SDR receivers and antennas. Such web based receivers are ideal for tracking signal propagation and its quality on different locations.